I’ve received some feedback about confusion regarding the definition of shoe heel-to-toe drop, and its implications for running style. 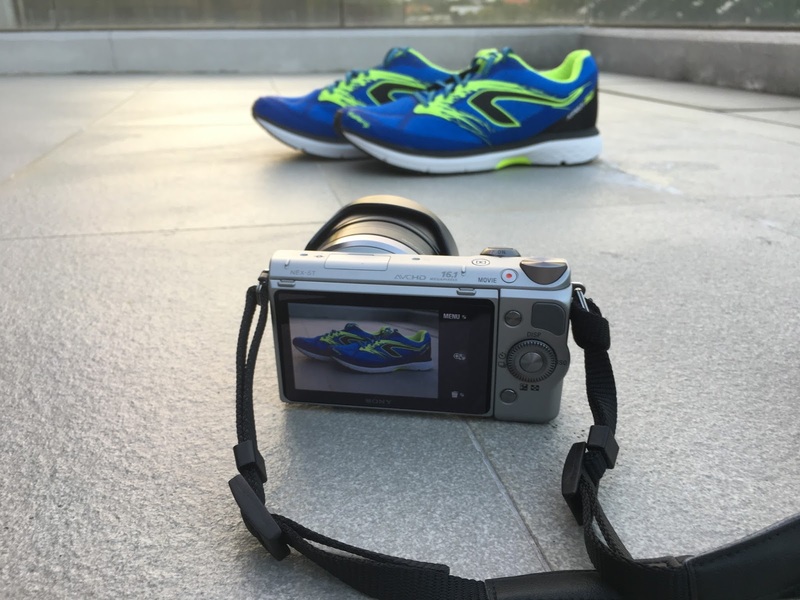 Therefore, I am writing this brief article to try and explain what it all means for the average runner looking to buy a new pair of running shoes. You may sometimes come across terms like heel-to-toe offset, or heel-to-toe drop when you look at the technical information about a particular running shoe model. They pretty much all mean the same thing: the difference in height between the rear part of a shoe and the front. Bear in mind that all technical data are generally given for a size US9.0 shoe. It goes without saying that a smaller sized shoe with the same heel-to-toe drop would have a steeper ramp angle (that's the slope from the heel to the forefoot). [This section was edited on 27 Nov 16 2348Hrs. 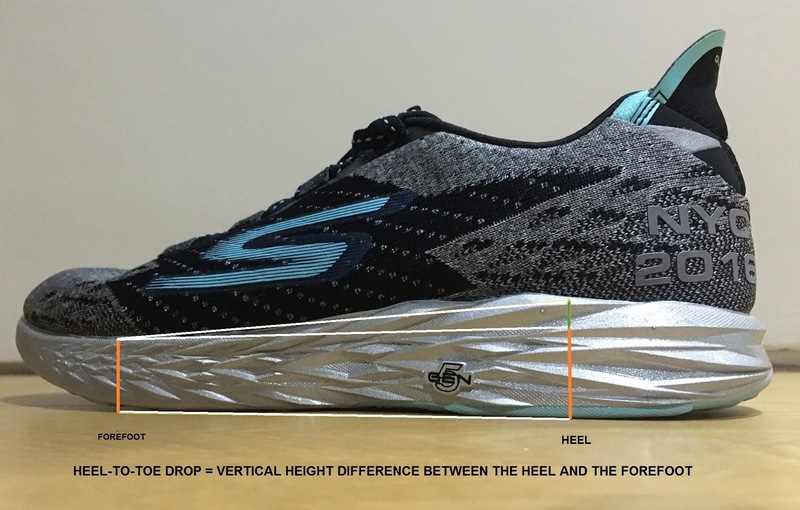 Thanks to Andy Neo for the correction] It is for this reason that brands like ASICS do not advertise the heel-to-toe drops for their shoes on their media platforms but prefer to focus on ramp angle, or the steepness of the slope between the heel and the front of the shoe. Another important caveat to interpreting the heel-to-toe drop of a shoe is that these numbers are measured in an unweighted environment. What does this mean? It means that if the midsole of the shoe you use is soft, and your foot sinks down when you run in the shoe, then the heel-to-toe drop when you are running will be smaller than advertised, as your foot generally sinks more in the heel than the forefoot since there is more material to compress in the heel. In the current retail market, there is a very wide range of shoes with different heel to toe drops. At the high end of the spectrum, you are looking at 10-12mm of drop, and these are what one would call a tradition shoe. Most traditional drop shoes tend to have a 10mm drop these days, and there are far too many to name here, but typical examples are the Brooks Launch, or the Adidas Adios/Boston/Energy Boost. There are still some 12mm drop shoes on the market but they are harder to find these days. Examples are the Mizuno Wave Rider 19, Brooks Adrenaline GTS, and Brooks Ghost 9. By and large, you will find that the heavier trainers from all the major brands will skew towards a 10-12mm heel-to-toe drop. It is generally thought that a higher heel-to-toe drop is more suited for heel strikers, as the added shoe thickness in the heel will help to provide more impact protection for the runner. In practical terms though, there are lots of forefoot and midfoot strikers who frequently use traditional drop shoes without any problems. Finally, there is the low drop range. Low drop shoes are the newest category on the market, and include brands like Newton, Vibrams, Altra and Carson. I put 0-3mm drop as a low drop category as for practical purposes, you won’t feel any heel when you run in these types of shoes. These shoes are targeted at the forefoot striking runners who do not like any heel in their shoes to affect their stride. Most of the Newton shoes are low drop, and you can see the drop designation on the side of the shoes. All the Altra models are zero drop. Altra is an interesting brand because I believe they were the first to admit that zero drop did not have to mean zero cushioning, and it was possible, indeed favourable, to have a highly cushioned shoe to cater to forefoot runners, and some of their models like the Torin 2.5 and Paradigm do provide excellent cushioning in a zero drop package. The lists are by no means exhaustive but you can see that a lot of brands have shoes with different drops and there is no clear trend on what type of shoe has a tendency to what type of drop. The reason for this is simple. There is no clear evidence that says any particular drop works best for any particular type of training/racing. You will find racing shoes with relatively low drops like the Hoka Tracer at 4mm, and racers with very high drops like the (discontinued) Brooks T7 with its 12mm drop, or traditional drop racers at 10mm like the New Balance 1400 series, or Adidas Adios. Similarly, there are heavy duty trainers on the market like the Hoka Bondi at 4mm, and the Brooks Ghost at 12mm. This article is not meant to tell you what type of drop is best for you. Choosing a shoe that works well is so much more than heel to toe drop, and I for one almost never take shoe drop into consideration when choosing a shoe. However, generally, traditional drop shoes can work for the widest audience, while zero drop shoes have the smallest margin for error as a heel-striker will notice the lack of cushioning with a zero drop shoe much more than a forefoot striker with a traditional drop shoe. It is best to test out different types of shoes to see what works best for you, and to always transition into a new shoe slowly to let your body adapt to the shoe over the course of 1-2 weeks.